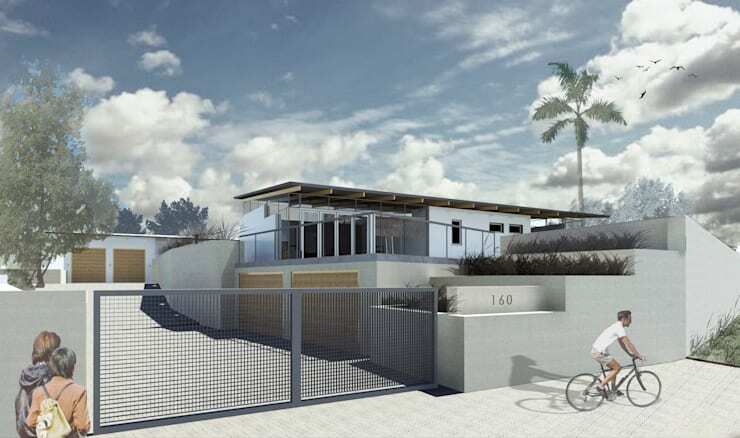 Today, we re going to explore a gorgeous home renovation with renderings and plans, designed by architects Gallagher Lourens Architects. This home is a conversion of a typical 1970s suburban home, which had been originally built on a sloping site. The new and modern design features two courtyards, allowing for a wonderful flow between indoor and outdoor living. The architects have also tried to exploit the gorgeous views, while ensuring that the home is protected from strong winds. 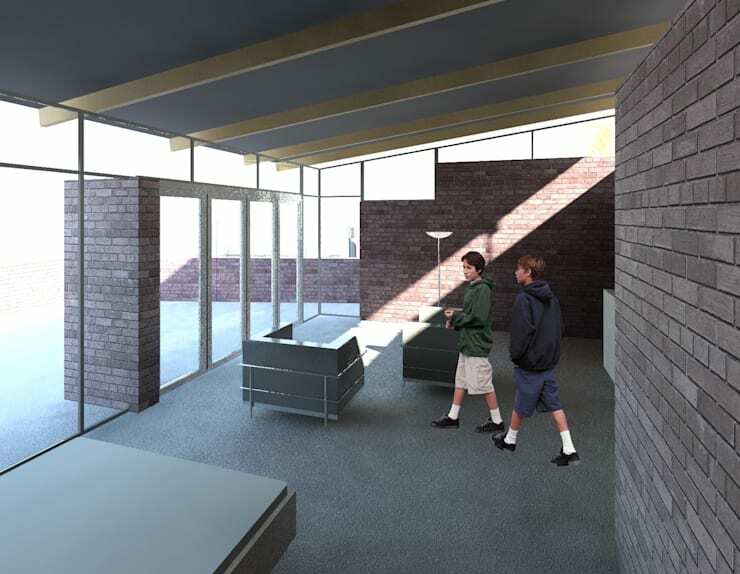 The central living area links to the two courtyards, with the windows allowing for an abundance of natural light to flow in at all times. This image shows just how modern and sophisticated the home is right from the get go. The designers have gone for a grey facade, which is very chic and stylish as well as a double-storey design. You would never think that this home was originally built in the 1970s. The home is securely positioned behind a large double gate, yet it doesn't look like its imprisoned in anyway. The gates are simple and stylish. The two double-garages allow for ample space for cars, bicycles and other items to be stored neatly out of sight. Don't you love the large, sweeping driveway, which welcomes people to the home? The flat roof neatly packages this elaborate home below it, resulting in a stunning overall look and feel. 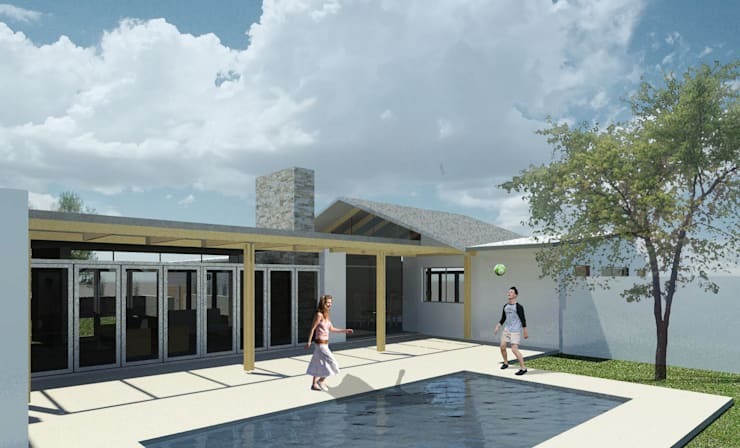 The first courtyard that we come across features a swimming pool and covered terrace, creating the perfect outdoor area for hosting braai's, playing with the kids or cooling down in the hot summer months. 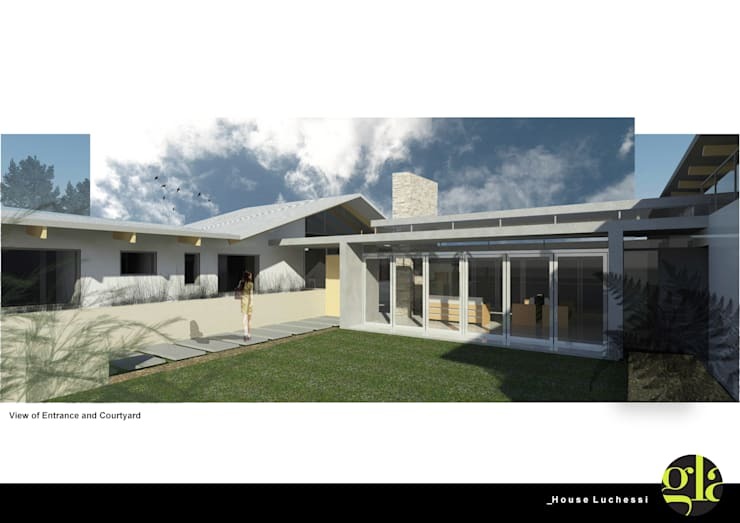 For a South African family, this exterior space is simply perfect as it is as multi-functional as it is spacious. Here we can see how the large glass windows and doors allow for that strong connection between interior and exterior space, opening the home up onto the outdoors. The home maintains its grey tones in this section of the home as well, while a stone chimney pops out the top. This mix of materials adds a slightly rustic touch to the contemporary home. The second courtyard features a large and spacious garden, which can be accessed from the living room. The garden is enclosed by the other side of the house, creating a very private area for the family. This is wonderful as it allows for play time, afternoons napping in the sunshine and even parties without any neighbours spying! Have a look at these 8 snazzy ways to improve your garden privacy for inspiration for your own home. Don't you love the stone garden path that runs down the side of the property? These stone blocks contrast beautifully with the green garden and provide a clear way for family and friends to make their way through the exterior space. In the living room, we can see how the abundance of glass walls and doors create a very light and bright interior space. Sunshine streams in from all angles! Not only is this aesthetically pleasing but it also means less money needs to be spent on lighting or heating this space, especially during the day. In the hot summer months, the doors and windows can be opened to allow a cool breeze to flow through the home. The interior space features raw brick walls, which adds an industrial chic look and feel to the home. This is as budget-friendly as it is savvy! 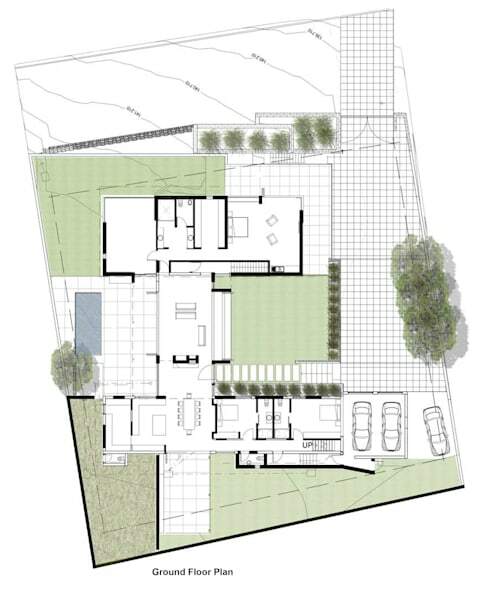 In this image, we have an opportunity to see a plan of the refurbished home. It truly shows us how the architects have made the absolute most of every square inch as well as how they have connected interior and exterior spaces. The home is grand in size, but it's also clear how nature plays a role throughout. Trees, lawn and plants have all been incorporated into a design. A plan like this is very important as it allows the family and the architects to remain on the same page throughout the process. Everyone will know what to expect from the finished product! If you've enjoyed exploring this home, you'll love this sophisticated suburban home with plans.